An interview with the Massachusetts senator in Philadelphia. 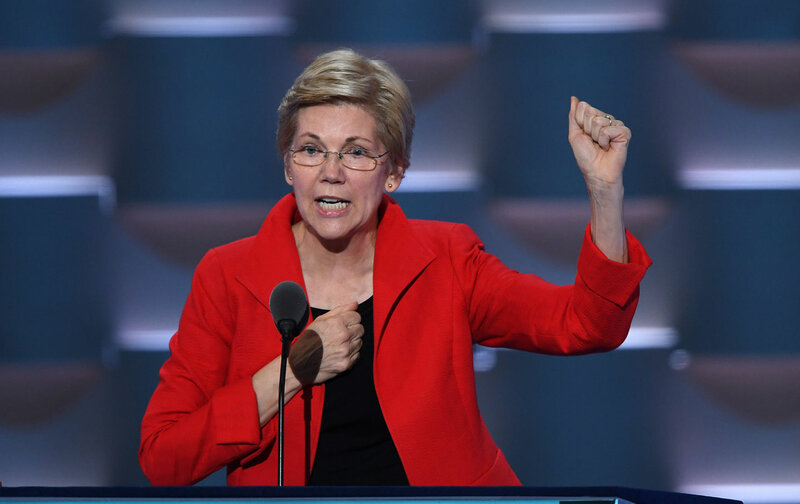 On Tuesday, for over half an hour in a ballroom several miles from the Democratic National Convention in Philadelphia, Senator Elizabeth Warren, also armed with a slick slideshow, laid out her pitch for fixing a badly broken economy. This is not a recent phenomenon. In a chart reminiscent of the hockey-stick graph in An Inconvenient Truth, Warren showed the increased costs facing families who are spending 57 percent more on housing, 104 percent more on health care, 275 percent more on college, and, in a bar reaching well beyond the top of the slide, 953 percent more on childcare. This runs counter to the conservative myth that wasteful spending is the cost of our economic issues. While cost of living has skyrocketed, Americans have compensated by spending less on food, less on clothing, and less on appliances. Warren makes the case that these changes are clearly the result of deliberate policy choices, designed to benefit the wealthy and powerful. Though his name was not mentioned during the presentation, Ronald Reagan clearly loomed large. “Some change begins to happen in the mid to late ’70s, some of it carries over into the ’80s, but 1980 is a good demarcation point because, it’s right around 1980, around the time Ronald Reagan is elected, you see this shift in government,” she said, including lowered tax rates on the wealthy, widespread deregulation, and decreases in domestic non-military spending. Warren noted that there’s now a whole generation who only knows this type of economy. The crux of her presentation is not a recitation of problems, but instead a search for solutions. For that reason a critical element of Warren’s analysis is not simply based upon economics but also on power and influence in Washington, DC. “The system has been corrupted because those with money and power have figured out that if they can influence just a handful of senators and representatives in Washington, they can wreak enormous wealth from it,” she said. But it’s not just contributions, Super PACs, and lobbyists. Warren attacked the policy-making infrastructure—think tanks, public-relations firms, and other operatives who work under the radar but have a corrosive impact on our democracy. That’s a much more grim view than anything said from the stage at the DNC this week. But Warren does retain some optimism. “Part of the message here is to make the point that, while the other side may have all the money and power, on our side we’ve got the voices and the votes, and if we use them we can change this government,” she said. She calls her fixes the “American Agenda.” It begins with four items with overwhelming public support: raising the minimum wage, refinancing student loans, expanding Social Security, and regulating big banks. The immediate counterargument in Washington will naturally involve paying for all those plans. But Warren proposes closing tax loopholes, like the tax break for bonuses which she claims would raise $55 billion in revenue over the next ten years. Slideshows are nice, but Warren knows raw political power is needed drive progressive change during the next administration. Ari Rabin-HavtAri Rabin-Havt is the author of "Lies, Incorporated: The World of Post-Truth Politics" and host of "The Agenda" on SiriusXM Progress 127. Find him on twitter @AriRabinHavt.